Subaru will whisk the covers off this Legacy Concept car at Detroit's North American International Auto Show in January 2009. It shows how the next-gen Legacy will look when it launches in late 2009 – and provides a glimpse at future Subaru styling. Which is always useful as we've worked out that nobody in the office today knows who Subaru's head of design is (or, indeed, if they actually have one!). 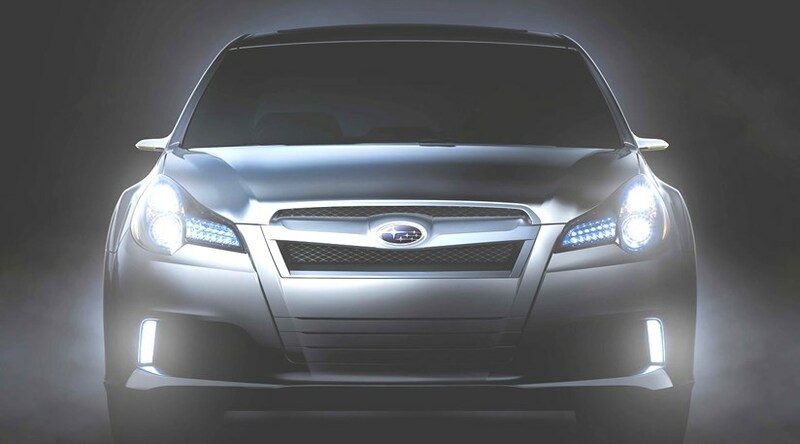 This teaser shot reveals a VW/latter-years-MG-Rover-style goatee beard grille with a fresh iteration of Subaru's grille, flanked by the now de rigueur LED headlamps swept back over the leading edge of the bonnet. We don't know the full tech story of the latest Legacy, but it will be powered by a 3.6-litre boxer engine sending drive to all four wheels. Naturally, the production Legacy will feature Subaru's latest boxer diesel engine.